Wonderful Woodward Canyon - Write for Wine: It's Wine O'Clock Somewhere!Write for Wine: It's Wine O'Clock Somewhere! Rick and Darcey Small founded Woodward Canyon Winery in 1981, the second winery in the Walla Walla Valley. 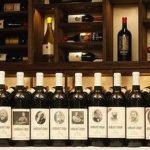 (Leonetti Cellar opened just four years earlier.) Rick’s family farmed for multiple generations on land that is now the estate vineyard. In 2003, winemaker Kevin Mott joined the team. And today, Woodward Canyon is one of the most-acclaimed wineries in Walla Walla. 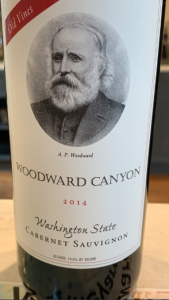 Woodward Canyon is known for its gorgeous Cabernet Sauvignons, in addition to Bordeaux-style blends, Merlot and Chardonnay. Of note, the winemaking focus is on quality over quantity. We visit the Woodward Canyon tasting room every time we’re in Walla Walla. Recently, we stopped in when we attended the Wine Bloggers Conference. These are our favorite “special occasion” wines during that trip: Old Vines Cabernet Sauvignon, Charbonneau Red and Artist Series Cabernet Sauvignon. Over the years, we have raved about Woodward Canyon Old Vines Cabernet Sauvignon. This is one very special Washington State wine. 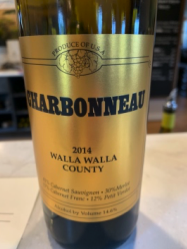 Originally, this spectacular Cab Sauv began as the “Dedication Series,” featuring a different pioneer of the Walla Walla Valley each year. But then it was renamed for its grapes that come from old vines planted in the early 1970s. The 2014 label features A.P. Woodward, for whom the canyon is named. This amazing wine is 96% Cabernet, topped off with four percent Petit Verdot. This wine is complex and layered, with the beautiful balance and structure that comes from old vine fruit. Aromatics of herbs, mocha, black fruit, spice and earth lead into flavors of black fruit, coffee, and milk chocolate. Not surprisingly, words such as stunning, plush, rich, vibrant, sophisticated, elegant, and gorgeous come to mind. Composed of 41% Cabernet Sauvignon, 30% Merlot, 17% Cabernet Franc and 12% Petit Verdot, this silky wine offers classic Bordeaux-style character. For example, a beautiful nose of red fruits and cassis, cigar box and crushed roses is followed by notes of ripe black fruit, baking spice, tobacco, mocha, coffee, licorice and graphite. This wine is drinkable now, with decanting. Or if you have patience, you can put it in the cellar for up to ten years. 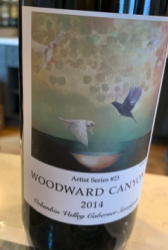 Since 1992, the Woodward Canyon “Artist Series” has showcased a classic, lush, textured Cabernet Sauvignon. In this vintage, 78% Cab is blended with 10% Petit Verdot, 8% Cabernet Franc and 4% Merlot. Aromas of black fruits, black olive, herbs, vanilla, cassis and baking spices lead into rich flavors of blackberry, licorice, dark chocolate, coffee and herbs. This wine can be enjoyed now, but it will benefit from additional cellaring. As you might expect from the name, the label changes every year with work from a different, talented artist. In conclusion, these three wines from Woodward Canyon are some of the best reds in this state. But Woodward Canyon makes many more wonderful wines too. Therefore, we highly recommend visiting their tasting room, located in a restored 1870s farmhouse, on your way into Walla Walla. You will find excellent wine, and fantastic staff who provide a memorable wine experience. Those are the reasons Woodward Canyon makes our list of Favorite Washington Wineries every year. Our hats off to Jerry and Steve, who were both knowledgeable and entertaining when we were in the tasting room. This entry was posted in Bordeaux Blend, Cabernet Franc, Cabernet Sauvignon, Chardonnay, Merlot, Petit Verdot, Walla Walla, Washington, Wine and tagged Bordeaux blend, Cab Franc, Cabernet Sauvignon, Chardonnay, estate wine, Merlot, Petit Verdot, Walla Walla, Washington wine, Washington wineries, wine, wineries, Woodward Canyon by Margot. Bookmark the permalink.